Personal Thoughts: I had previously done an Ironette from Iron Man 2 so I decided it’d be a cute idea to also do the backup dancers when Steve Rogers goes on his USO tour. I also really wanted to have fun with the skirt! This dress was not easy as I wanted certain parts to be detachable as well as have a 1940’s show girl feel. The dress couldn’t be too short and the lapels would have to be removable for future replacements (such as a sequenced lapel if I wanted it). I heavily altered a pattern for the top using a u-bra that I would wear with the costume as my guide. I added an eyelet to the bottom of the V neck so I could attach a lapel to the bottom and installed a zipper in the back. I mathed out how many panels of the skirt I would have to create in order for it to fit under the vest perfectly. I used a stiffer satin material for the vest and two different types of satin (the white was stiffer and the red was limp) for the skirt. The vest was fully lined and unhooks from the top so that it’s easier to step into the dress. There are 14 panels in the skirt. Each panel was hemmed in their correct thread color to avoid the headache of hemming the entire skirt once all the panels were together. The middle of each pleat was sewn so that it would maintain the straight edge look for years. A cummerband was quickly drafted and put together with left over red material. The zipper was put in last after the skirt was attached to the vest. 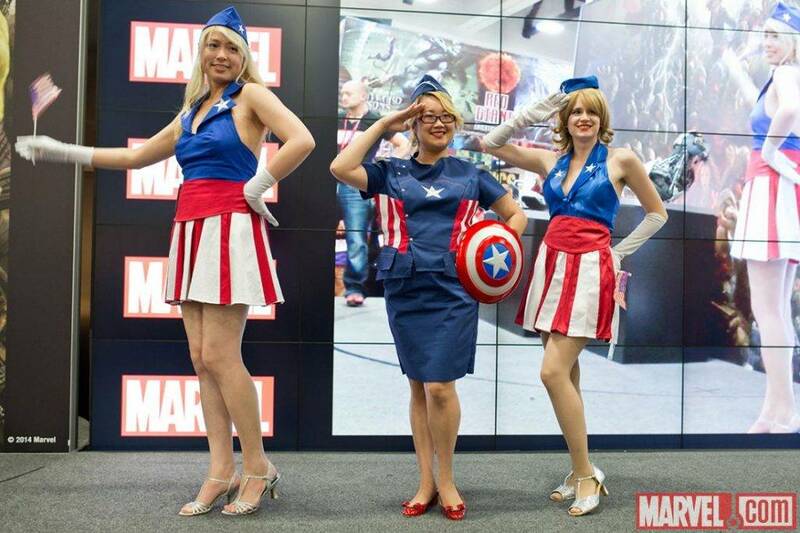 The hat was hand drafted with help from online tutorials from an unofficial USO dancer group for this costume. Buckram, wire and felt hold the hat to keep its shape and hair pieces were placed inside so that it stays on. In the end, it took me about four days (one for drafting, one for the skirt alone, and the other two for the hat and vest). I had to make another one with three days to spare at a smaller size and I ended up knocking it out in 8 hours because I’d already did it once and kept my patterns. I’m still surprised I even did that. I always had plans on remaking the skirt. There weren’t enough pleats and once I kept wearing it I realized how much I really adored this little costume so re-making the skirt was an absolute MUST. I spent two back breaking days removing the skirt from the vest, making 12 red/white panels (respectively). The first version was patterned myself but I used some tips from the USO group that went to Dragon*Con a few years ago. I upped the panels from 14 total (mistakenly 16 whoopsie) to 24. Once finished, the underside was properly serged and attached to the vest. I continue to pull this costume out as it’s been one of my absolute favorites. It’s comfortable, very cute, and I’m always overjoyed when a real service member comes over for a photo. It’s a pleasure to make them smile! This costume has not had a proper photoshoot yet.